We open with a prologue of a kid that seems to boss around his entire family, we later learn that this is all staged. We cut to Superboy and Robin dodging laser fire, and then being surrounded by lots of robot versions of them in what looks to be a jungle. We then flash back to two days earlier, as Jon hops on the bus to school. Whilst on the bus ride to school, Jon sticks up for his friend being bullied by two other kids. Only for them to shoot him with spit wads too, just as they were doing to his friend. Later after school, Jon and his friends engage in a snowball fight with the same bullies from the bus. Things start to get out of hand when the bullies add rocks to their snowballs. Jon almost loses his cool, but decides not to use his powers against the bullying kids. Damien helps out against the bullies, disguised as the bus driver. Later in the Batcave, Bruce heads out as Batman, and tells Damien to stay behind, as he skipped home schooling and has let his studies fall behind. Meanwhile at the Kent/Smith home Clark and Lois have family time, and tell Jon how proud they are of him for restraining himself against the bullies. Clark flies off as Superman on Justice League business, while Lois tells Jon it's past his bed time. Damien shows up in Jon's room, and convinces Jon they need to investigate some recent break-ins and hacking attempts at Lexcorp. The boys in Metropolis, attempt to break into Lexcorp, only to be confronted by Lex Luthor in his Power Suit. Story - 5: Let me start of by saying that I have been waiting for this book since Rebirth began, and that I am really excited that it has finally been released. Now I don't know whether DC has been sitting on this book for a while now, as it was originally meant for release in the second wave of the Rebirth titles, or if they put it on hold until they established or re-established some of the key players. Whatever the case may be, it's a welcome addition to all the other really good books DC is pumping out right now. Peter J. Tomasi... I have been fan of his work for quite some time now, I liked his Green Lantern Corps run, and loved his Black Adam mini-series from a few years back, and recently have thoroughly enjoyed his run on the Superman title. This book seems like a spin-off of the Superman book in many ways, as the family dynamic for the Kent's/Smiths was set up there. In saying that, Tomasi is no stranger to the Bat family either, as he wrote the Batman and Robin title during the New 52. 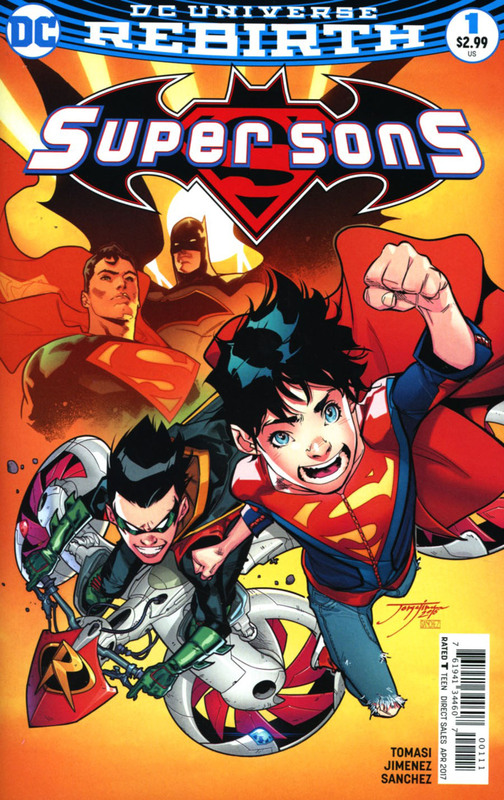 So he has a good handle not only on the "Super Sons" but the World's Finest also! Tomasi captures the essence of Superman so well, that it feels like he's been writing the character for decades. The reason why I mention that is, for quite some time now, I had been unhappy in the direction DC steered Superman into. One of my main gripes was the death of Ma and Pa Kent. Having them as supporting characters for so many years in the books, it felt like losing family when DC established them as dead during the launch of the New 52. With Rebirth though, I feel that we have gotten an evolution of sorts with Superman, where he has stepped into the Pa Kent role with Jon. And Tomasi has been fantastic at portraying Clark as a father, and in many ways raising Jon as how pa Kent once raised him. 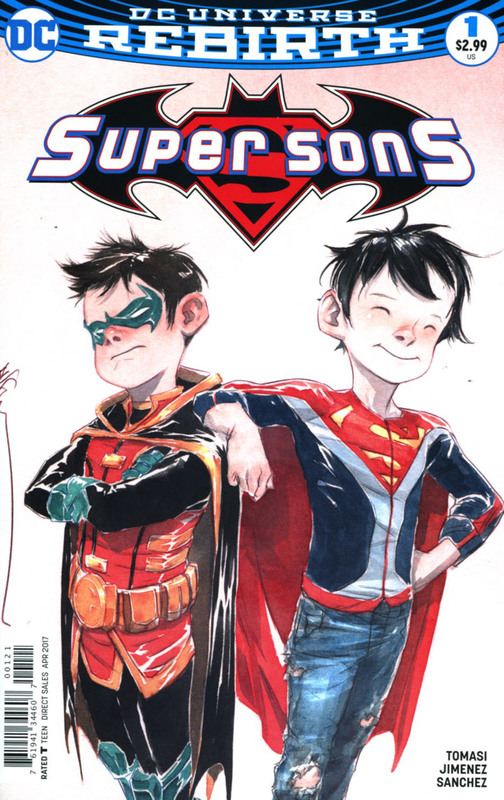 And this is the best example I can give as to how Tomasi captures the essence of Superman... "The son becomes the father..."
Now Damien on the other hand is a character that I never quite liked all too much. I understood the story that Grant Morrison wanted to tell with him, and was happy when he died at the end of his run on Batman. Can't say I was too thrilled when DC bought him back, maybe it's because I've always been more of a Tim Drake guy, or that having a son, Batman somehow became something less than what I thought he should be, I just couldn't jump on the Damien Wayne bandwagon for some reason. However, in the last year or so all that changed. I've enjoyed reading Damien a lot more. I think a lot of that has to do with the DC Animated movies. The Damien story throughout those has been quite good, and I guess I understand the character a whole lot more now. Or it could be that Rebirth as a whole has really got me excited about comics again, and I have a more positive outlook towards what's being offered. This was a strongly well-built fist issue. It clearly doesn't have a linear story, as we jumped from a prologue to the thick of an action scene, only to be thrust back to a couple days prior to the events of the present. The scene where Jon takes off his glasses in anger towards the bullies during the snowball fight had to be my favorite. I loved the restraint that Jon was able to show in not giving into the temptation of using his powers. That followed by the scene at home later that night, Lois and Clark talking with Jon, being proud of him for doing the right thing. It was a stark difference to the Batcave scene with Batman's style of parenting, which is more like honoring a code than anything else. This dynamic is what I'm really going to enjoy I feel in the months to come. The Prologue was interesting. At first I thought they were filming a sitcom, but after looking at it all again, it may be someone holding his family or someone else's, hostage while he plays "happy families". Only time will tell. It's intriguing nonetheless. The tone of this book so far has been great, it doesn't seem too serious or dark, it feels like it will be fun, which is what I wanted more of from DC. One of the books I used to love when I was younger was Young Justice, by Peter David and Todd Nauck. It was always a fun read that didn't take itself too seriously, and I feel that this book will be similar. Not so slapstick as YJ, but funny with a lot of heart. A good first issue, I'm really excited about this title. Can't wait to read the next issue, Lois and Clark have managed to keep Jon a secret from the rest of the world, and it looks like Luthor is about to discover there is a whole lot more Superman has been hiding. Art - 5: Jorge Jimenez is one of my favorite artists working at DC right now. I absolutely love his style. It feels like a combination of Manga and traditional comic art, much like Joe Maduriera, yet very different from everyone else's and one that is completely his own. I feel he is the perfect artist for this book. He has a fresh young style which is perfectly suited to capturing the zany adventures of Jon and Damien. From the over exaggerated facial expressions, the animated body language, the out of the box panel work and the highly stylized and detailed backgrounds, Jimenez makes the page pop with an almost kinetic charge. In all honesty, Jimenez art is one of the biggest reasons I wanted to review this book to begin with. Combined with Tomasi's writing, this book is a sure-fire hit... And it's just the first issue! Jimenez has a great handle on Superman, we know this from his fill in work on the Superman title (also written by Peter J. Tomasi), and here he shows he can take on the Batman as well and have him look equally as good. He keeps the look of both Clark and Bruce very youthful and full of vitality. Even though I am not the biggest fan of some of the elements of the current suits that Clark and Bruce are sporting (Superman's blue boots and Batman's odd shaped utility belt), Jimenez makes them look great. The small details are what really made me go over this book twice. Take a look at the scene where Jon takes his glasses off when the bullies throw the snow ball with rocks in them, he has the "angry glowing eyes," but when he stops himself and puts them back on, he looks and feels almost like his father. Speaking of Clark, we get a mild shirt rip as Clark changes to become Superman, and even though he isn't wearing his glasses, the way Jimenez drew him touching his JL com link in his ear, it looks as if he were taking of his glasses as he opens his shirt to reveal his suit underneath. I mentioned body language earlier, again the scene where Clark changes to Superman and kisses Lois goodbye, Jimenez really has me believing that this man is in love with his wife. There is a great deal of passion in that kiss, reminiscent of the photo of the sailor kissing the girl at the end of the war. In the case of Damien, the body language has you believe that he is bursting with energy and needs to go punch someone or something. The smaller details such as the way the clothes fit on the characters or the fashion choices of the characters, sets them up to fit in the real world, shoes for example. Jon wears red shoes that look like something that Nike currently produces, Lois is wearing Chuck Taylors, Damien has his lace up Robin boots on, under the mechanical lift and "old man shoes" he's wearing as he masquerades as the substitute bus driver. Everyone one has his or her own unique look to them. I know that I may be laying it on rather thick this review about the art, but I really want to express how much I appreciate a comic book with great artwork that is really thought out. I have always been an "art guy," so I always love it when an artist really draws with everything they have. You can tell that Jimenez loves these characters and is putting forward 100% effort into making us the reader feel it. Before I leave, I need to mention the colors. I have stated in many of my reviews in the past that the colorists are the unsung heroes of the comic book medium. They don't nearly receive enough of the credit they deserve, so I want to acknowledge the awesome work that Alejandro Sanchez provided this issue. He is a frequent collaborator with Jimenez, and he always brings a quality to his work that rivals some of the top colorists in the business. I'd put him right up there with Alex Sinclair and Peter Steigerwald. Nothing is oversaturated, and there is plenty of subtlety that establishes the mood of the scene or setting. The best example of how great his palette is, is the scene in the Batcave, how cold it feels, compared to the warmth of the Kent (or White's as they are known) home. Excellent book, highly recommend it! Cover Art - 5: An excellent cover by Jimenez and Sanchez. We have seen this image many times since Rebirth began, and it works as a strong cover for the first issue of this series. I love that they are using the Superman/Batman logo from the Superman/Batman book pre New 52.